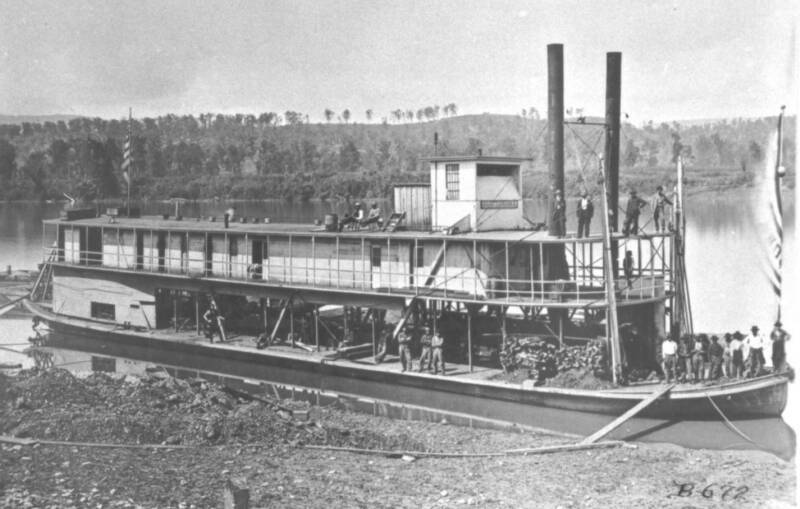 The "R. C. Gunter" was one of many riverboats that operated on the Tennessee River in the late 1880's through the turn of the century. The boat was owned and named for Bridgeport resident Rufas C. Gunter, a Confederate veteran. Bridgeport, Alabama story continued on next page. Click here for next page! Bridgeport was first known as Jonesville as early as 1848 and was named for Charles Smithson Jones, the largest landowner in the area. The community was established beside the Tennessee River and in the early 1850’s the Nashville & Chattanooga Railroad would forever change the settlement. The railroad’s construction reached Jonesville in 1852 and bridged the river and Long Island in 1854 with the first train (non-revenue) crossing January 14, 1854. A river port established a few years before combined with the new bridge resulted in a name change for Jonesville to Bridgeport, which was applied to the post office on December 15, 1854. The river and rail traffic through Bridgeport resulted in growth of the community with a general and mercantile store and other retail establishments being built along the river and around the railroad depot. In 1860, the Jasper Branch Railroad was authorized for construction from Bridgeport to Jasper, Tennessee fifteen miles to the northeast in Marion County. The line’s construction was begun, but not completed until after the American Civil War. The line would play an important part in the development of the Sequatchie Valley in later years. The American Civil War with its division of northern and southern states over states rights and slavery soon brought the conflict to Bridgeport. On April 29, 1862, Union (northern) troops under General Ormsby M. Mitchell attacked Confederate (southern) troops under command of General Danville Leadbetter that were camped on the hill at Bridgeport overlooking the river and bridge. The ensuing battle resulted in the deaths of several men from both sides and the destruction of the railroad’s drawbridge on the opposite side of Long Island by the Confederates as they retreated towards Chattanooga. Mitchell, when withdrawing from Bridgeport in early May 1862, ordered the long railroad truss bridge burned, which the Confederate’s had attempted to blow up during the battle of April 29th. Union forces under command of General Ormsby M. Mitchell are shown above following their rout of Confederate forces under command of General Danville Leadbetter during the Battle of Bridgeport on April 29, 1862. The hill shown is today known as Battery Hill. Bridgeport would continue to play a vital role during the first years of the war as Union and Confederate troops would capture and recapture the town. In the summer of 1863, Confederate troops under General Braxton Bragg burned the town and a portion of the long truss bridge as they withdrew from middle Tennessee to Chattanooga prior to the Battle of Chickamauga. Union forces under command of General William S. Rosecrans would soon occupy Bridgeport and Union forces would hold it for the remainder of the war. The town would witness the building of new fortifications and the rebuilding of ones built before by the Confederates. In addition, the town would be the location of a Union field hospital and military cemetery and where several Union steam transports and gunboats were constructed from late 1863 to middle part of 1864, the first of which was the U.S.S. Chattanooga with the U.S.S. Bridgeport being one of the last. Also during the war, the railroad drawbridge at Bridgeport was burned one additional time with both bridges being rebuilt by the Union Army along with the railroad between Nashville and Chattanooga. Bridgeport’s location on the railroad and Tennessee River led to it becoming a major supply base for the Union Army and Union General William T. Sherman’s Atlanta Campaign. The Union Army would continue to occupy Bridgeport until well after the end of the war in 1865 as reconstruction began after the defeat of the Confederacy. The Union Army's Quartermaster Department built the U.S.S. Bridgeport pictured below at Bridgeport, Alabama in 1864. This was one of the last boats built at Bridgeport by the Union Army. The Union Army's Quartermaster Department built the U.S.S. 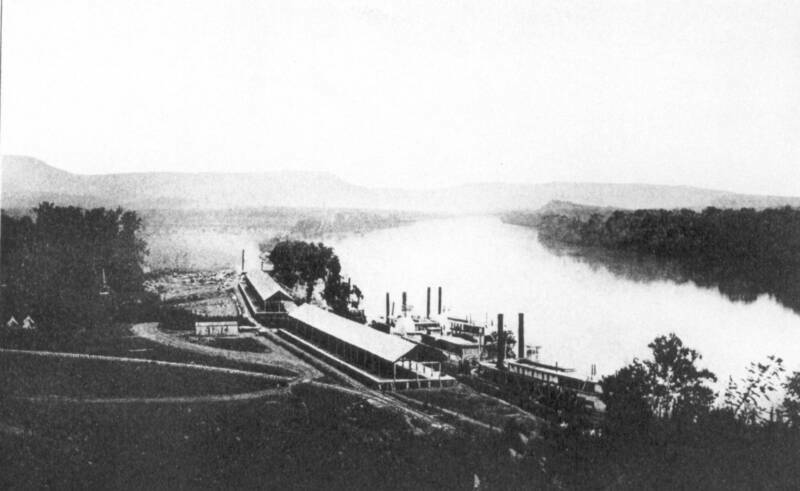 Chattanooga pictured above at Bridgeport, Alabama in 1863. This was the first built here and helped open the new supply line to Chattanooga and the besieged Union Army following the Battle of Chickamauga. The Union Army's storage and transfer depot complex at Bridgeport can be seen in the photograph below dated 1864. 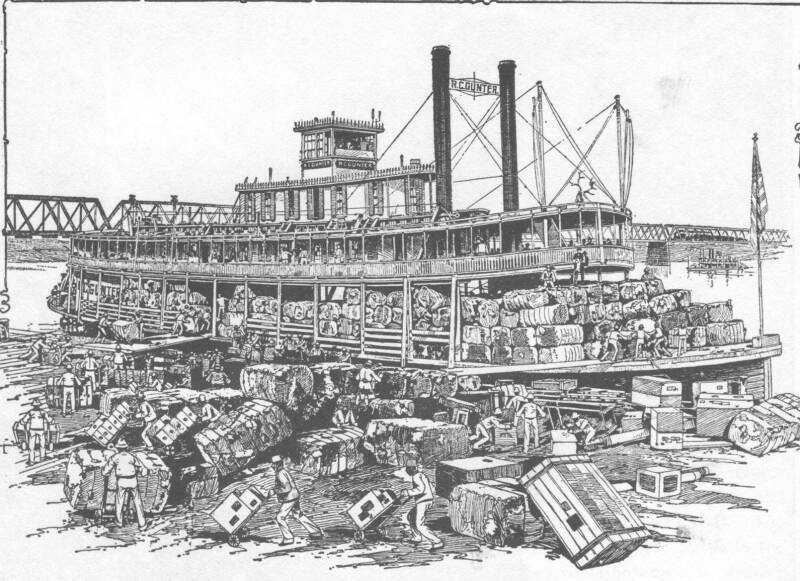 Supplies coming in from Nashville were transferred by railroad to steam transports for the trip up the Tennessee River to Chattanooga where they supplied Union General William T. Sherman's troops during the Atlanta Campaign. 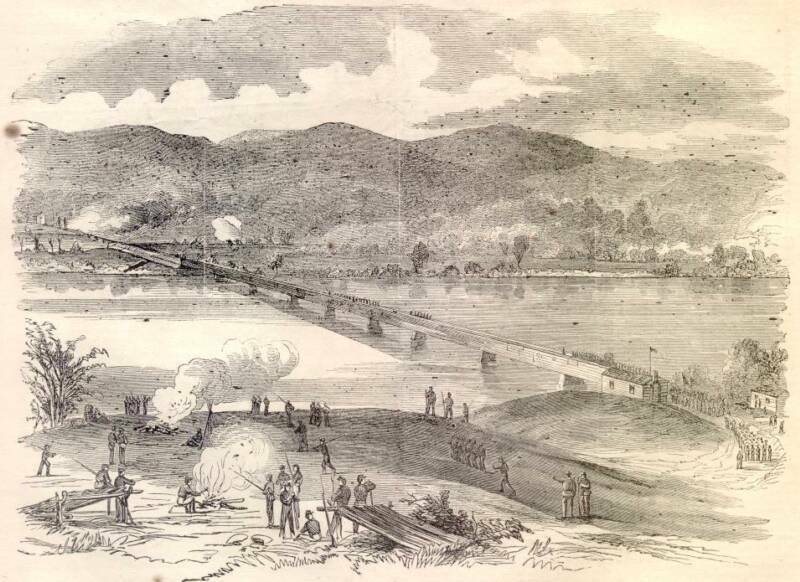 The Union Army is pictured above in August 1863 building a pontoon bridge across the Tennessee River at Bridgeport during their chase of Confederate General Braxton Bragg's troops towards Chattanooga prior to the Battle of Chickamauga. The ruins of the Nashville & Chattanooga Railroad bridge destroyed by Bragg can be seen in the background. The Union Army would later rebuilt the bridge. The Union Army fort at the point of Battery Hill is pictured above in 1864. The fort was under command of Colonel Prince Felix Salm-Salm of the 68th New York Infantry. The fort along with one across the river and two blockhouses guarded the railroad bridges at Bridgeport from Confederate attacks during the last two years of the war.